Joshua McCormick painting Connect, and Joshua McCormick’s Reconciliation. Emerging artist Joshua McCormick selected as one of the Young Creative Leaders Fellowship recipients in the 2018/19 Create NSW Fellowships. Congratulations on receiving a Create NSW Young Creative Leaders Fellowship. How did you go about making your application stand out? My application was about supporting and identifying young Indigenous artists in remote, disadvantaged communities in NSW. We have so many gifted kids in the bush who don’t pursue their talents. They basically have no support. I currently and will continue to work with these communities that seriously need attention in relation to arts. So, my application addressed multiple Create NSW priority areas which would have made it stand out. Tell us about the creative development program you will undertake as part of your fellowship and what you hope to gain from the experience? 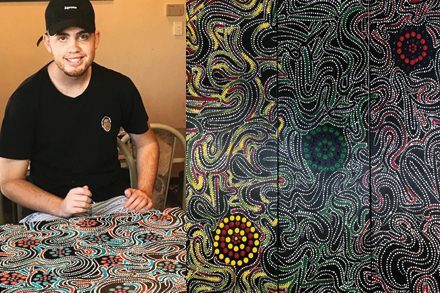 My main objective is to initiate a “Walgett Shire Youth Artworx Group” with the support from peer organisations like PCYC and Walgett Youth Development through the local council. Having their support will ensure I can encourage and support a large number of kids to attend the workshops. I personally know many of these kids across Walgett Shire through my involvement with many community programs when I was younger. I would hope that the positive outcomes will be many; with me gaining some invaluable experience with presenting and facilitating workshops; identifying talented young people; and the young people themselves gaining confidence in creating their own art, and to finally showcase their artworks to the communities. You’re delivering ten art workshops at all three youth centres in Walgett NSW. What will the workshops involve and what outcomes do you hope to achieve? If I can identify several talented youths in each of our communities who are keen to learn and listen, I believe we can form a self-sustaining art group. The local council and PCYC have offered their facilities for my workshops. I would also like to plan group visits to cultural spaces and places. The idea behind this is to help the group connect back to their cultural roots and ancestors. I am also committed to promote that art can be not only rewarding, but it can also be a form of income. I have completed many artworks and currently art is my only source of income, so I can be an example and share my learnings. Where do you see yourself in 5 years and how do you think this fellowship will help you to get there? Being able to help others identify their talents is very rewarding. If I can create an interest in art with one kid, that’s priceless. Culturally, art played a huge role in our lives generations ago and we seem to have lost that. This grant will allow me to help others to create, believe and engage in artwork. In five years’ time, I hope I am still painting and many houses and offices across Australia have a Josh McCormick artwork! People appreciate art, especially indigenous art. My art is not your standard style. Its contemporary Indigenous art, fresh and different. I use colors, contours, dots and dashes to depict what I want to say, sometimes I don’t want to say anything… that’s art. Not every painting has to tell a story. I hope I never lose the ability to ‘do my own thing’. What advice would you have for anyone who is thinking about applying but doesn’t think their application is strong enough? Keep it simple. Stick to the facts of what you want to do and be sure you can achieve the goals your project sets out to obtain and deliver. Never stop dreaming! Applications for Young Creative Leaders is now closed. Click here to find out more information on Young Creative Leaders Fellowships.